The 30 pieces, limited edition RM 68-01 Tourbillon Cyril Kongo is a colourful and eye-catching piece of art that just so happens to be a watch. Swiss watchmaker Richard Mille opened its doors to street artist Cyril Kongo to use its creations as a blank canvas. The result is the 30 pieces, limited edition RM 68-01 Tourbillon Cyril Kongo -- a colourful and eye-catching piece of art that just so happens to be a watch. While, on the surface at least, the watch appears to a simple creation, in fact, the artwork spread across the inner movement is as complex as the tourbillon complication itself. Inspired by colourful graffiti and urban murals, the technique required to paint the watch alone took over a year to develop. A special airbrush was developed to allow Kongo to spray his colours with the delicately, one droplet at a time on all individual pieces. The weight of the paint had to be strictly determined beforehand to avoid jeopardising the calibre’s equilibrium, essential to its functioning. The artwork that can also be seen through the back of the case made of NTPT Carbon with black ceramic bezels. 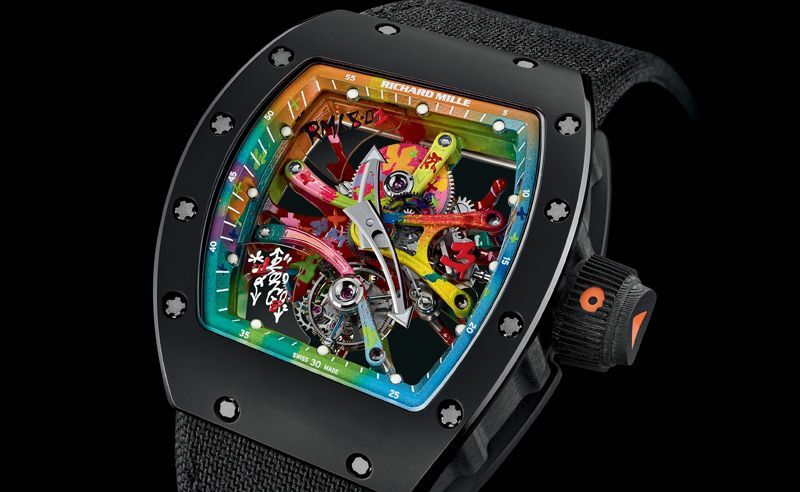 Richard Mille can now bring colour into your life, having previously brought some spicy eroticism.